Marcel Kittel managed to chalk up another Tour de France win yesterday, demonstrating that despite an imperfect leadout, the German’s unmatchable speed proved to be enough to deliver him a second victory at this year’s race. 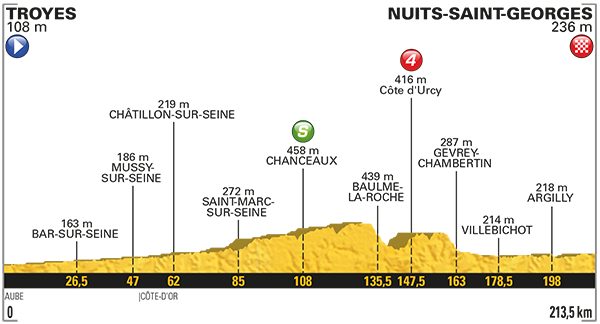 Stage 7 could prove to be a hat trick of stages in the first week for Kittel, the Quick-Step captain a strong favourite for the 213.5km trip from yesterday’s finale in Troyes to Nuits-Saint-Georges, taking in only a single categorised climb along the way. However, the terrain is relatively rolling and still has the potential to prove a draining affair if the weather compounds the attrition with temperatures soaring beyond 30 degrees celsius. Marcel Kittel appears to be performing on an entirely different level right now, dominating the bunch sprints with incredible confidence and ruthless finishing speed so far. Whether it is an alternative approach from Quick-Step due to recent team injuries, or simply a case of misfiring, Kittel has done well to secure his two victories after unusually poor leadouts. The fact that it seems inevitable that he and the team shall see their efforts click perfectly into place during this race, it could prove to be a battle for second place with the German ace on such imperious form. Arnaud Démare took some interesting racing lines during the finale yesterday, just falling short of being able to truly push Kittel for the win in Troyes. Resplendent in the green jersey currently, with Peter Sagan now gone, France has a real hope of seeing a native rider atop the Paris podium in a leader’s jersey. It is becoming lazy to say, but Démare’s form really appears to be a once in a lifetime period for the FDJ rider, potentially setting him up for a historic Tour de France. Today’s finish is not perfect, though he seems capable of challenging for the win upon any terrain right now and could see his almost kamikaze attitude catch the faster riders by surprise. Nacer Bouhanni is still without a debut win at his home grand tour, an incredible fact when considering just how talented the French sprinter is. Though missing the crucial guidance of Geoffrey Soupe, Bouhanni is not that far off challenging the likes of Marcel Kittel for stages and is due a good slice of fortune soon. Boxed in on Stage 6 during the decisive moments, if he can find a better wheel to follow into Nuits-Saint-Georges there will be no reason to exclude him from stage winning contention. André Greipel will have felt like he could have done better on the previous day, despite just how far ahead Marcel Kittel was of his rivals once crossing the line. Lotto-Soudal have been performing consistently as a team, contributing well to the chase and leaving enough in reserve to position their sprinter when it proves crucial. He will need his maximum turn of pace and a perfect leadout to realistically challenge the indomitable Kittel, but it is possible. Dylan Groenewegen still is yet to see the pieces fall into place for the young Dutchman, yet this power based finish will provide him with great hope of avoiding being snared up by those around him once again. A clear run at the line will make him a real threat given his immense top speed, Lotto-Jumbo are not far from a perfect leadout right now and are likely to be highlighting Stage 7 as a potential breakthrough day. Dan McLay, Sonny Colbrelli and Alexander Kristoff all have the potential to podium if the odds prove favourable. Posted on July 6, 2017 by Spokenforks	This entry was posted in Le Tour de France 2017, News and tagged Alexander Kristoff, André Griepel, Arnaud Démare, Dan McLay, Dylan Groenewegen, Le Tour, Le Tour de France, Le Tour de France 2017, Le Tour de France 2017 Stage 7 Preview, Marcel Kittel, Nacer Bouhanni, Nuits-Saint-Georges, Sonny Colbrelli, Troyes. Bookmark the permalink.